I was recently watching a pre-election podcast of the CBS McLaughlin Group show (clip below) in which John McLaughlin asked Pat Buchanan to predict the outcome of the presidential election. He said: "The outlook is [a] probable Obama victory." I paused the podcast at that point and thought that what Pat said was not exactly a hard call to make given the multimedia rendition of data that I just watched. I wondered at that point what he would have said if he was also asked to predict the margin of victory in percentage points. (I found out the answer later in the show but I didn’t know that at this point.) Here’s a summary of the show's pollsters' predictions. The point spread ranges from a low of 3 to a high of 15. I've added an additional pollster "pundit" which I affectionately call "Kid" Average and include this numerical wonder as a candidate for the best estimate prize as well. A question for you. If we could turn back clock to before the election results were known, which polster would you have bet on to have made the best projection (i.e. came closest to the final outcome based on the polls provided by McLaughlin?) 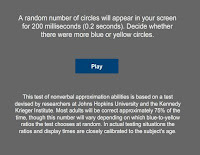 I would have bet my money on "Kid" Average who as I found out later did reasonably well. (See spreadsheet below.) 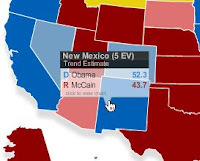 According to today's (11/10/08) CNN website Obama won by 6.6 percentage points. I used a simple average of the polls to come up with my prediction. 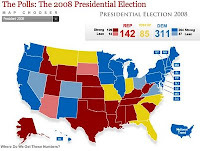 The pollsters not only use averages but also more sophisticated regression methods to make their projections. Here's what is written in the FAQ page at pollsters.com: "In most cases, the numbers are not an "average" but rather regression based trendlines. The specific methodology depends on the number of polls available. If we have at least 8 public polls, we fit a trend line to the dots represented by each poll using a "Loess" iterative locally weighted least squares regression. If we have between 4 and 7 polls, we fit a linear regression trend line (a straight line) to best fit the points. If we have 3 polls or fewer, we calculate a simple average of the available surveys. So it's possible for students to see real applications of these techniques as they learn about statistical methods. Plenty of math here for students to sink their teeth into where the technology is integral to the discussion. Oh, yes. What prediction did Pat make in term of points? Check it out in this next clip. It sounds like John and some of the others could use a math tuneup or two. If you are one of those "i can't get enough of this" folks, the drama of the election is still playing out in some corners especially the race for the Senate in Minnesota. Currently Norm Coleman leads Al Franken by 206 votes! See http://www.fivethirtyeight.com/2008/11/more-minnesota-madness.html for the latest details. Students: I would like you to make a prediction about who will win the presidency and by how many percentage points. Write up your rationale for your prediction. On Wednesday, we’ll analyze your data and see who came up with the "best" prediction. I suppose one “easy” way that a student may do this would be to go to a website like this one and see what the pundits are predicting. From the current (3:15pm 11/3/08) graph it is clear that Obama is the favorite to win. The 311 electoral votes predicted would top the required 270 votes necessary. So predicting Obama’s victory appears to be a safe bet. But what about the point spread? If you click on the map above you will go the website where the actual map is. If you hover the mouse over the map you get a state by state prediction of the point spread. But where do these numbers come from? If you notice there is a link on the left side and just below the map (above) that answers the question. Since I don’t have a class to work with today, I’m hoping that you might be willing to play along with me and send in your prediction with a rationale for the number of points you chose. (I’m using Google Docs Spreadsheet for this activity.) Go to questionnaire and post your entries. There is only a small window on the entry form so you might want to write out your response elsewhere and then copy and paste in the form. I’ll be back on Wednesday with an analysis and an explanation of how this exercise can illuminate important math ideas. CLIMEnotes: 9/16/08 Jerry Becker provided an interesting link this morning regarding an article in the NY Times: http://www.nytimes.com/interactive/2008/09/15/science/20080915_NUMBER_SENSE_GRAPHIC.html Always fun to see how the media takes advantage of technology to present an idea in an interesting and creative way. Technology updates at NCTM: some signs of life? Call for Manuscripts: 2010 Focus Issue: Learning and Teaching Mathematics through Technology. It sounds like the NCTM Editorial Board is interested in catching up with what's happening with technology in math by soliciting manuscripts for their Mathematics Teacher journal. Unfortunately, by the time these papers get published in 2010 most of the articles will need an update. This Web 1.0 strategy may need to be reimagined*. At the affiliate leadership meeting in Philly last month Hank Kepner (NCTM's new prez) encouraged members of CLIME and others to share ideas about how best to incorporate Web 2.0 (and other tech as tool) ideas in the teaching and learning math. I'll be sharing these ideas in future CLIME blogs. In the meantime please share your ideas with me. (Click on the envelop icon below. Board's response to the technology resolution is in... and it ain't pretty. The NCTM board has replied and as expected it ain't pretty. See Board Acts on 2008 Delegate Assembly Resolution. I arrived at the affiliate conference in Philly on Friday (8/15/08) not knowing that the Board's action plan was made public. 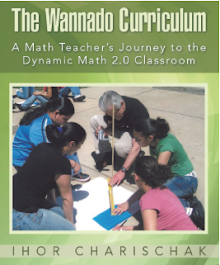 So when I asked Jim Rubillo about it, he was surprised that I didn't already know it was already posted on the NCTM website. (Later I discovered that info was so well buried that I had to search for it.) Jim tried to be upbeat about the Board's (in)action on technology explaining why the Board can't do much mostly because of the expense. But when I pressed him on it and asked if they looked into any creative ways to raise $$$, etc. he said that (the creative part) was the job of the program committee and there is not much that the Executive Director can do about that. So the power is with the Board and the program committee...I should have known. The rest of the Friday evening program was handled by Affiliate Committee folks who had us go through a meaningless icebreaker and then introduced us to John Maxwell's words of wisdom on leadership via CD which I could barely hear because the audio was so bad. That would have been OK except for the fact that our homework was to read John Kotter's take on leadership and change entitled "The Iceberg is Melting: Changing and Succeeding Under Any Conditions" which NCTM sent me ahead of time to read. So why Maxwell as the starting event? Don't know. My affiliate colleagues (mostly presidents and president-elects of state groups) sitting at my table didn't seem to be bothered by that. I was already dreading day 2 believing that maybe my trip down here was going to be a waste of time. The only redeeming part of the day was that I was staying with Scott Steketee (of Key Curriculum Press) and his family. I had a good time commiserating over some good ale we shared. Day 2 was much, much better mostly because of Hank Kepner (NCTM's new president) and Jim Rubillo (Executive Director.) Their contributions made the trip worth while. Jim's two presentations one on NCTM and the other on (a welcome surprise) "The Iceberg is Melting." Rubillo turns out to be a very savvy guy who intimately knows the ins and outs of NCTM and the strengths and weaknesses of the folks who participate in NCTM trials and tribulations. Also, what came across is that he wants to be a change agent and he's figuring out ways to avoid the obstacles that the Board can sometimes create. (Maybe, thinking outside of the box is not on their job description?) In other words, I came away with the feeling that Jim was one of the good guys. Also, Hank told me that NCTM needs to do more in the areas of technology and needs help from people and groups like mine to come up with workable ideas. So I think there is some room for grass roots efforts behind the scenes that could make things better. Of course we are in the midst of the Slow Revolution that Larry Cuban writes about, nothing dramatic like some of us more impatient types would like to see. The other thing that I hadn't realized is that each of the 230 or so affiliates are independent groups that don't have to follow any NCTM predefined protacol which opportunes a group like CLIME to grow into something that could showcase technology in math learning and teaching at its best using the tools of Web 2.0. Does this mean we're on the verge of a possible tipping point where students will actually WANT TO learn the same things that we encourage them to learn? It won't be easy. But then nothing of quality ever is. Just ask Jim and Hank! Board's action on Technology concerns at NCTM meetings to be acted on soon. I checked in with Mary Ferris at NCTM to get an update on when we will hear what the board decides to do about the resolution that was passed at the Delegate Assembly at the NCTM in Salt Lake City in April. She replied: The NCTM Board of Director’s meeting is July 24-26. Affiliate leaders and Delegate Assembly participants will be notified through the AffiliateNews electronic newsletter when responses have been posted. Passed resolutions and the Board’s actions will be printed in the NCTM News Bulletin this fall. I'll let you know the outcome as soon as I find out. He was long a jewel of the MIT faculty. Now, after a devastating brain injury, mathematician Seymour Papert is struggling bravely to learn again how to think like, speak like, be like the man of genius he was. Read the article. Seymour Papert inspired the origin of CLIME back in 1988 and his courage continues to inspire me now. 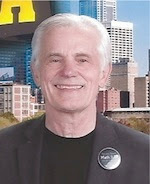 *Dotmac switched to mobile me this week and has caused much havoc with iWeb publishing. So I will be using Blogger's site for my CLIME blog from now on. CLIME's home page will continue to be at clime.org hopefully without too many glitches and will have a link to the current blog. No one ever said that the Web 2.0 world was going to be easy to navigate... but then these are the pioneer days. Welcome aboard! Last year just as the Salt Lake City (SLC) program committee was about to meet, I wrote an email to Skip Fennell regarding my concerns about technology at the annual meetings. Here it is. My affiliate group CLIME celebrated their 20th anniversary at their annual meeting during the NCTM meeting in Atlanta in 2007. It’s hard to believe that it has been more than 20 years since Papert and Logo made such an impact on our collective consciousness making us aware of the possibilities that technology can have in math education. 2007 was also the first year in more than a decade that there were no computer lab sessions at the annual meeting. Many of my CLIME friends were concerned about the message this sends to the NCTM community, namely, that computer workshops are no longer important or needed. Since my participation on the program committee as the technology liason (SF, 1999) the labs have always been for me an indication that NCTM takes technology very seriously especially after technology was declared one of the essential principles the 2000 Principles & Standards. Unfortunately, NCTM’s technology principle starts to fade in its impact when the vendors take over demonstrating the power of technology. In Atlanta Texas Instruments once again was a dominant player in the vendor area and textbook companies continued to roll out technology into their packages in a formulaic way. After some reflection, I realized that discontinuing the labs in their pre-Atlanta form may not be a bad idea after all. Maybe it’s time to focus on a more relevant way of using computers in today’s (and tomorrow’s) classrooms so that their use reflects current and emerging technologies. The computer lab model is slowly giving way to a newer vision of how computers are used in schools. Laptops and handhelds in an wireless environment are slowly making their way into classrooms. The emergence of portable technology with the possibility of every student having their own laptop will have a tremendous impact on the teaching and learning of math in the coming years. CLIME’s dream has always been to have a “strand” of sessions at the annual meeting that demonstrates and lives up to the vision of the technology principle. The labs were our best hope for that in the past. But now with more universal wireless access to the Internet, laptops, handhelds and Web 2.0 sessions at NCTM can embrace the vision of the technology principle in a more unique and compelling manner. My CLIME group suggested that it would great if we could get a conversation going with the program committee about how the technology principle can be promoted now that the labs are gone. Is this a possibility? What other issues are there that the group might not have considered? Skip responded positively to this email and shared my message with the SLC program committee However nothing of substance materialized. So now I’m looking forward to the 2009 meeting as a possibility to make an impact. I need your help in putting the Technology Principle back on the map highlighting some of the Web 2.0 features that can be used in the teaching of math. I’m heartened by the work of TPCK and want to see more discussion of how it impacts future curriculums. If your schedule is anything like mine. I’m supposed to be at the Affiliate Group Caucus at the same time I’m leading the session at NCSM. So I’m planning to solve the problem by cloning myself. I’m interested in any thoughts you may have on this matter and what we can do collectively to have an impact in Washington. So on April 9th I will be introducing a new initiative for CLIME 2008-2009 which will hopefully culminate in an useful expression of our ideas. We need our collective voices to be heard.